One of the main reasons the Bitcoin gambling industry remains sturdily established is its variety of gambling products and services that are strongly geared toward the benefit of its players. Among these fun-filled gambling amenities, Bitcoin casino bonuses are the ones that strongly appeal to the majority of bettors. Through these in-house promotions and offers, gamblers are able to step up their game. These bonuses, however, have one detrimental factor overall and that is its wagering requirement. Although the offers are certainly enticing, gamblers are not able to cash out until such requirement is fulfilled. Answering to this long-term dilemma is the online casino 4Grinz. 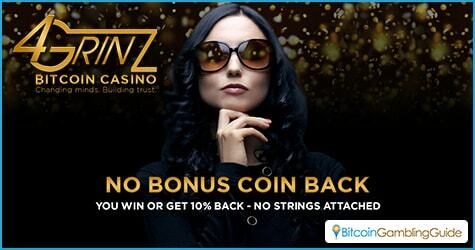 Known for its sophisticated platform that processes instant gameplay, banking, and a lucrative set of casino services, this Bitcoin casino has made itself more distinct through its exclusive Bitcoin bonus called the No Bonus Coin Back. The 4Grinz No Bonus Coin Back is an exclusively designed bonus that works similarly with the conventional cashback bonus. 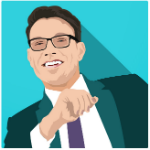 This 4Grinz special, however, refunds players a certain percentage of their losses on real bitcoins with no strings attached. This means that bettors who have subscribed for this promotion can get Bitcoin returns and withdraw them right away. According to a 4Grinz representative, this No Bonus Coin Back starts off with a 10-percent return in losses and increases, depending on the players’ account status. To further compliment the joys of the No Bonus Coin Back, 4Grinz has structured its platform to be one of the finest online gambling hubs that are dedicated to cryptocurrency players. Compared to its competitors, this Bitcoin casino powered by CoinGaming.io features a diverse set of games that range from classic slots to HD quality ones that can go on par with today’s high-caliber mainstream animated movies. Other than its diversity in quality, the 4Grinz game library consists of over a hundred games designed specifically by a number of world-class game providers like Betsoft, Booming-Games, Endorphina, Explosive, GameArt, Pantaloo, Play‘n GO, and Takisto. 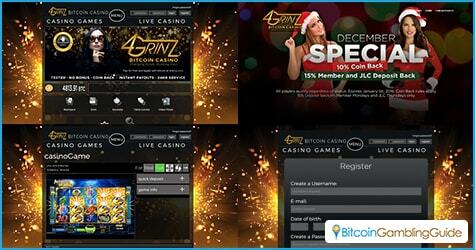 To top it all off, 4Grinz offers an impressive roster of Bitcoin games such as the crowd-favorite Bitcoin slots, table games, video poker, blackjack, roulette, and even progressive jackpots, high limits, and live dealer casino games.